For developers looking to enable the Raspberry Pi for voice recognition, a high-performance microphone and advanced noise-canceling software are vital for optimal performance and successful trigger-phrase detection. Andrea’s patented audio filters significantly improve the barge-in performance of any speech recognition device, making the PureAudio™ Array Microphone Development Kit for Raspberry Pi 3 an exceptional Raspberry Pi microphone. For pricing and availability, please contact our Customer Service department at (800) 707-5779. The product also has integrated adaptive Beam forming and Noise Reduction digital filtering software. 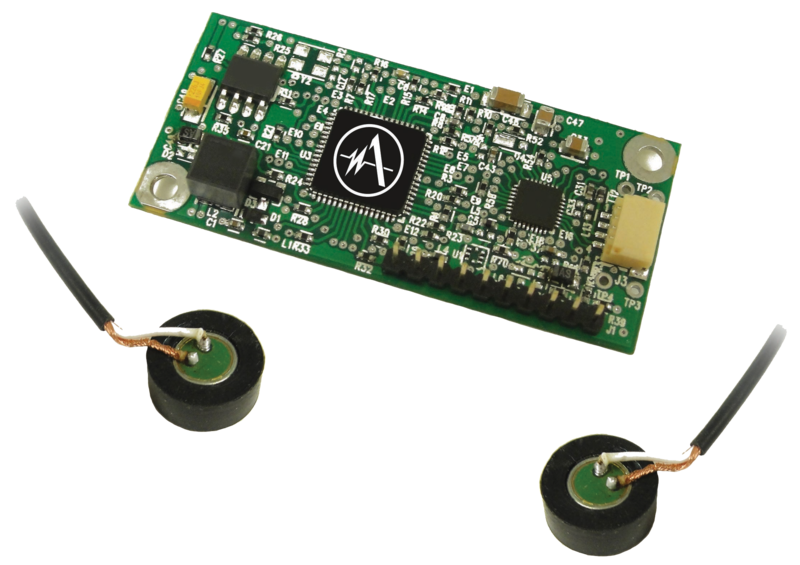 The DA-250 is a small compact Stereo Array Microphone and Digital Signal Processor (DSP) circuit board platform that can easily be integrated into many different OEM devices that would greatly benefit from directional noise canceling microphone performance, but in the past has been unattainable with an embedded microphone configuration. Requiring only two tiny holes in the faceplate of a device, the DA-250 Stereo Array Microphone can deliver directional microphone sensitivity without the need for acoustic baffling, as found in large parabolic waveguides or long shotgun tube type microphones. System Configurations: Stereo Array Mic w/DSDA (Beam Forming and & Noise Reduction), Stereo Array Mic w/DSDA3 (Aggressive Beam Forming and Noise Reduction), Mono Microphone w/EchoStop (Full Duplex Echo Cancellation and Noise Reduction). The USB-SA Array Microphone provides a USB digital audio adapter to bypasses the computer’s standard integrated sound system, providing a high fidelity/low noise digital audio platform that is isolated from the computers motherboard. 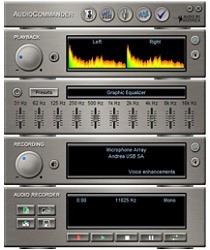 This external digital audio system utilizes the computers central processor to run Andrea’s AudioCommander™ adaptive beam forming directional microphone and noise reduction software. PureAudio’s Adaptive Digital Noise Reduction Filter reduces up to -40dB of repetitive noises, while supporting wide frequency bandwidth sample rates of up to 48Khz. 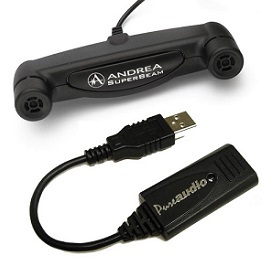 AudioCommander™ provides a intuitive graphic user interface to control EQ and noise cancellation filters for Andrea USB audio Devices running on Windows PCs. 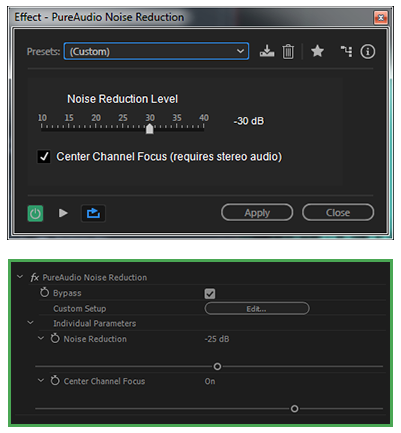 PureAudio’s Adaptive Digital Noise Reduction reduces up to -40dB of repetitive noises, while supporting sample rates of up to 48Khz. Great for noisy mobile broadcast segments. 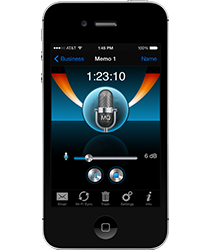 PureAudio™ Plus Recorder is a full function digital voice and audio recording application for use with Apple iPhone, iPad & iPod Touch devices, with additional features, including: bookmarks, stereo recording, etc. 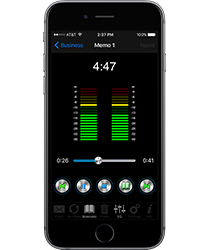 PureAudio™ Live Recorder is a full function digital voice and audio recording application for use with Apple iPhone, iPad & iPod Touch devices. 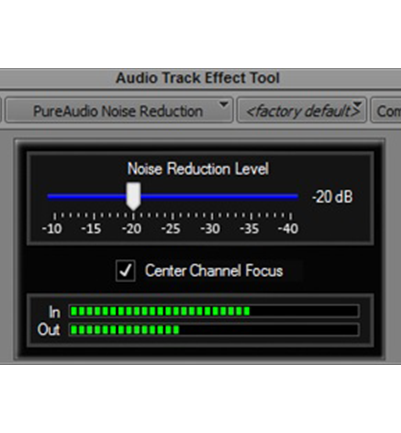 Andrea Audio Software for Mac provides a intuitive graphic user interface to control EQ and noise cancellation filters for Andrea USB audio Devices running on the Apple Mac OS. Click Here for Information on Product Warranties. Have questions about our audio technology?